Looking for a job? RASKC is hiring! 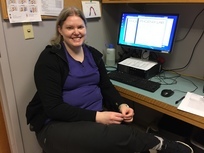 RASKC welcomes a new full time veterinarian to our staff-- Dr. Heidi Hendrickson. She is originally from the Seattle area and recently practiced veterinary medicine in Wisconsin. She is glad to be back in Puget Sound. Dr. Hendrickson works the Wednesday through Saturday schedule. Dr. Amanda Murdock, who is now RASKC’s Veterinary Clinic Manager, works the Sunday through Wednesday schedule. This spring RASKC has adopted a new philosophy, along with several new policies and procedures, as part of the Adopters Welcome program. This program helps animals by removing unnecessary barriers to their adoption, in part, by creating a more welcoming atmosphere. 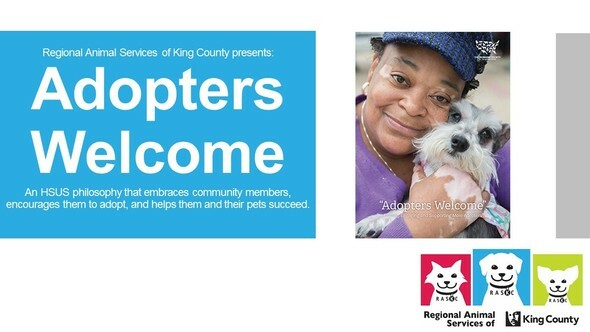 Adopters Welcome embraces community members, encourages them to adopt, and helps them and their pets succeed. As part of this program, all of RASKC’s adoptable animals are color-coded to help give guidance to prospective adopters. “Easy Going Green” indicates that these pets are adaptable and carefree. They are wonderful companions who love to go with the flow. “Bashful Blue” animals are gentle and loving, but might be nervous in new situations. They might need some time to come out of their shell. Once they do, they are very devoted friends. Rambunctious Red animals are spirited and energetic. They have fun-loving personalities and benefit from lots of daily playtime and exercise. The staff who perform temperament testing assign an initial color to the animals. The animals’ color can change if their behavior suggests that might be appropriate. Customers do not need to fill out an application first in order to meet with cats. Meet and Greet volunteers and customers no longer need to wear gowns & gloves or wash hands between cats. Please always make sure to visit with kittens first and sick cats last! 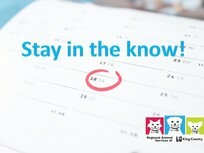 Adopters will receive a refund if they return their animal within 90 days of adoption. Signs about the new RASKC adoption colors have been posted in the volunteer room. Here is a link to a website and video that describes Adopters Welcome. RASKC is very happy to feature a great new video on safe cat handling by volunteers and other tools on our new online resource hub. Produced by the Animal Humane Society, this video (35 minutes) vividly gives tips on how to deal with cats who are in the somewhat stressful shelter environment. Whenever new cat-oriented volunteers onboard with RASKC, they are emailed a link to this video. RASKC also encourages highly skilled, very experienced volunteers to click on video as a refresher. A link to the video is also featured on RASKC’s new resource hub on the homepage of your volunteer record when you access VicNet. Other featured training videos include “How to prepare cat food trays for RASKC” featuring Shelter Helper Instructor Carolyn Dunstone here and a video to help if you’d like to submit a posting for RASKC’s blog. RASKC volunteers who work a scheduled shift often access their online record via VicNet to mark absences and fill-in shifts. Some foster volunteers might be less familiar regarding how to access VicNet. Here’s a video on how to access VicNet. You gain initial entry by going to the volunteer page on RASKC’s website, then clicking on the button for RASKC volunteer sign-in. You then enter your user name (your email), then click on “forgot my password.” A temporary password will be sent to you. Retrieve it, then return to the VicNet sign-in page. From there you will see RASKC’s new resource hub! Meet Volunteer of the Month Jayne Roddy! Jayne is one of RASKC’s longest serving volunteers, working in a variety of roles. Jayne began fostering about 24 years ago, and she continues to do so. Jayne helped launch RASKC’s Tukwila Petco Cat-Care Team in 2013, and she has been serving as a leader of the team ever since. Jayne also fills in on Early Morning Cat Crew. She worked several summers in RASKC’s Mission Reunite: Help & Hope for Lost Pets program. For many years Jayne worked a weekly shift on the Dog Team. She served as a Dog Team mentor and helped out with special adoption events. Jayne still helps with dogs for Comcast filming. Read an interview with Jayne on our Tails from RASKC blog. Check out more community events on RASKC’s Facebook page. All-day introductory training: Saturday, April 8 -- Deadline to apply: This Monday noon, March 20.